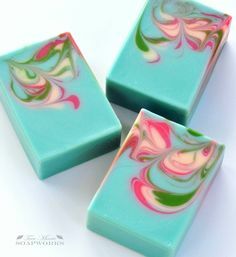 Using herb and flower infusions in soap can add a little something extra special to your soap. I love using both chamomile and calendula (marigold) infusions in my soap. Both impart a pretty butter yellow to the finished soap. 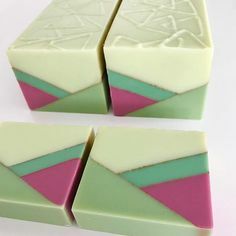 There is a slight scent in the oils, too, but I find that scent doesn’t usually survive the saponification process, and I have used fragrances and essential oils successfully in soaps with infused oils. There are a couple of techniques you can use for infusing oils. You can put the flowers or herbs in a jar, pour your oil over them, and let them infuse for several weeks, but I like the slow cooker method, mainly because it’s quicker, and I’m impatient. I purchased these handy “tea bags” from Bramble Berry (who is not sponsoring me; I just like the product). While you can pour the oils directly over the botanicals, I have found it is pretty messy, and you have to strain the oil later. The tea bags allow the botanicals to infuse the oil without making a mess. I try to use about ½ to 1 ounce of botanicals (which is a lot more than you’d think—they are light). I put the botanicals in the tea bags and seal them closed with an iron. Then I put them in a jar, I pour olive oil over the filled tea bags. I put a few inches of water in my slow cooker, turn it on low, and gently lay my jar in the water. I let the oil infuse in the heat of the slow cooker for about five hours, turning the jar over every once in a while (be careful; it’s very hot). The jars can be hard to open afterward, but I have a nice infused olive oil to use in my soap when I’m done. 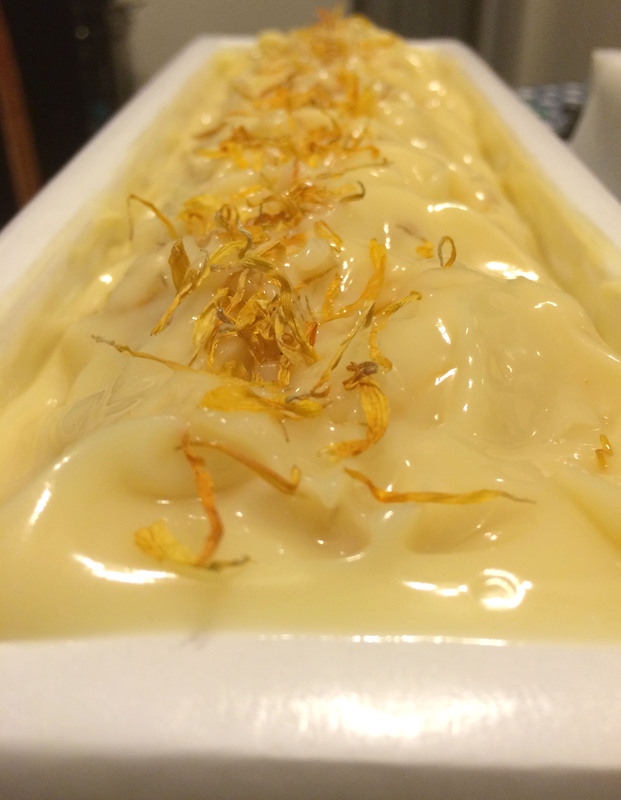 This soap is made with calendula-infused olive oil and decorated with calendula petals. If you want to try out infused oils in your own soap, check out this recipe for a one-pound batch. Infuse dried calendula flowers in olive oil for this conditioning soap. This soap is superfatted at 6%. Put the calendula petals in the tea bags and iron edges to close. 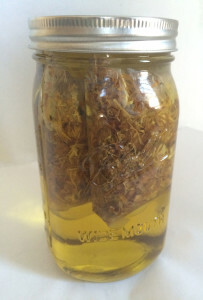 Place the calendula bags into a large jar. Put the jar on a scale and tare the scale. Add a bit more olive oil than you need. This recipe calls for 170 grams, but some of the oil will be soaked up by the calendula petals and the bags; it will be hard to get every last drop out again. Screw the lid tightly on the jar and place it in a slow cooker on low. Let the oil infuse from 2-5 hours. Set the infused oil aside to cool. It will be too hot to soap with right after the infusion. When your infused oil is cool, prepare your water and lye. Measure out 162 g distilled water and set aside. Measure out 59 g lye in a separate container and set aside. Carefully add the lye to the water and stir until it is dissolved. Set the lye solution aside to cool. Measure out your hard oils (106 g coconut, 106 g palm, and 22 g shea butter) and melt them down. Add 170 g infused olive oil and 21 g castor oil to the melted hard oils. Once your lye water has cooled (I usually combine my oils and lye water at about 100ºF), add the lye water to the oils and blend to a light trace. Add your fragrance (optional) and either whisk in or stick blend carefully. You can add calendula petals to your top for extra decoration. Calendula petals keep their color in cold process soap, so you can even add it to the soap itself. Whether or not the soothing qualities of calendula survive the saponification process is up for debate, but the infusion does impart a nice, light color to the soap. Why not try it and see if it works for you? I stumbled upon this recipe while looking for calendula cp soap. After the infusion is finished, can the used calendula petals be used in the soap itself or do they have to be discarded? Heather, my gut says “yes,” but I don’t think I’ve actually tried it. You might experiment with a small one-pound batch to see how it works. What oil can replace palm oil? Palm adds hardening characteristics to the bar, and there is not a good vegetable oil replacement. You can use lard or tallow if you don’t mind using animal products. Soap doesn’t have to have palm oil, but it will make the bar last longer. If you do substitute palm for another oil, you should always run the new recipe through a lye calculator.